Just how crazed is the Environmental Protection Agency? When I say “crazed”, I mean just how far out of touch with reality, with science, with the economy, with common sense, and with the American people is the EPA? Ever since the Supreme Court made one of the greatest blunders since the Dred Scott case, declaring carbon dioxide (CO2) a “pollutant” that could be regulated by the EPA, that deranged agency has been pushing a tax on CO2 emissions from cows, pigs, and other farm animals on which we depend for milk and meat at the local supermarket. According to Encarta, in 2005 there were an estimated 95,848,000 cows in the United States. Presumably, there are comparable numbers of pigs, goats, and other critters that emit belches and farts sufficient to destroy the Earth with the CO2 they emit. Nor should we overlook the six pounds of CO2 that the 307 million Americans exhale daily. Since there is NO global warming and the Earth has been cooling for the past decade, the proposal that these farm animals be taxed constitutes a criminal act, devoid of any justification. 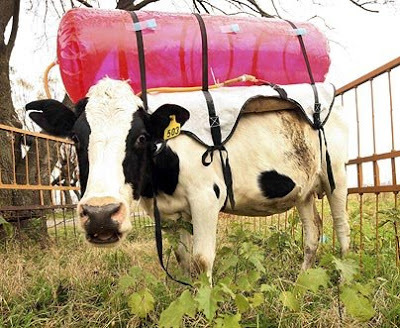 Since CO2 plays virtually no role whatever in so-called “climate change”, taxing farm animals is a violation of the known science and an assault on the economy in the name of the greatest hoax of the modern age. It is not, however, a matter of “saving the Earth” so far as the EPA and the rest of the Obama administration is concerned. It is MONEY. And money is POWER. The proposal, floated in late 2008, would impose a per-cow tax on any farm or ranch with more than 25 dairy cows, 50 beef cattle or 200 hogs that would require a payment of about $175 for each dairy cow, $87.50 per head of beef cattle, and $20 for each hog. Suffice it to say that dairy farmers across the U.S. are being forced to send many of their herd to the slaughter house because the price of milk has fallen to the point where it is unprofitable to maintain them. Owners of even a modest-sized cattle ranch would face additional costs of $30,000 to $40,000 a year. Add a tax on cows and you end up with a nation that has to import more milk than oil. Taxing farm animals is a great way to bankrupt dairy farmers and cattle ranchers, along with all those who raise hogs. After that, it is only a matter of time before Americans would all have to become vegetarians because the cost of meat would put an end to that part of our diet. As bizarre as the EPA proposal is, the effort by the Democrat-controlled Congress to impose a Cap-and-Trade bill on the nation in the name of reducing CO2 emissions dwarfs the farm and ranch proposal. The Heritage Foundation has crunched the numbers on Cap-and-Trade concluding that job losses would exceed 800,000 annually for several years. Durable-manufacturing employment would decrease by 28 percent. Machinery-manufacturing job losses would exceed 57 percent. The same would hold true for textile-mills, electrical equipment and appliance manufacturers, paper and paper product jobs, and jobs involving plastic and rubber products. Cap-and-Trade isn’t just a job-killer, American Solutions estimates that it would increase gasoline prices by 74 percent, electricity rates by 90 percent, natural gas prices by 55 percent, and add $1,600 a year to the cost of living of a typical household. The result would be to make the Great Depression look like a day at the park, but minus the hot dogs and ice cream. This is what House Speaker Nancy Pelosi and Senate Majority Leader Harry Reid have planned and they want the bill passed before Congress goes home for its summer recess. At that point, the destruction of the U.S. economy would be complete and there would be no reason for Congress to return. Does this seem an extreme conclusion to you? No, it is the reality the nation faces.